The root box is visible just to help you move and position the Sunny Spells. Make it transparent when you don’t need it anymore. 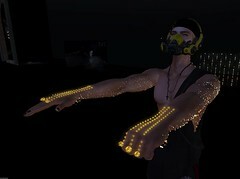 Posted in Animated mesh particles lights, architecture & landscape, decos & furniture, E.V.E Studio, Illumination Lighting, Mod and Copy items for builders and artists, News, Second LifeTagged E.V.E's animated mesh particles lights, glitter, lights, rays, sunny spellsBookmark the permalink.